Mayoral Election: How Does London Fare In Fares? BethPH Mayoral Election: How Does London Fare In Fares? Transport fares are a hot topic in the mayoral election campaigns especially after another increase at the start of this year, not to mention the pledges and counter-pledges from the candidates. So we thought we'd take a look at other cities with underground rail networks and see how their fares stack up against London's. Click on the links on the city names for underground maps. The notoriously-crowded metro system has a PASMO card which appears pretty similar to London's Oyster card. We especially like the FAQ page for PASMO, which is illustrated with a nifty pink robot, something TfL's website is sadly lacking. A ¥500 (£4) deposit is required upon purchase of the card and it can be topped up at ticket machines or station offices. Fares are calculated by distance rather than zoned and range between ¥160 (£1.30) for a short trip of 1-6km to ¥300 (£2.40) for 28-40km. A Metro All-line Pass appears to work like a travelcard allowing unlimited travel on any line and costs ¥16,820 (£133.55) for one month. Courtesy of a Japanese colleague, we can advise that travelling from Ikebukuro to Ginza on the Marunouchi Line (which is apparently like going from Shoreditch to Liverpool Street) costs ¥190 (£1.50) whereas travelling from Wakoshi to Ginza (more like Ealing to Liverpool Street) costs ¥270 (£2.15). Paris uses a zonal system similar to London's with six circular zones radiating out from the centre. A single adult ticket which allows you to travel on the Metro, the bus or the RER (Réseau Express Régional) costs €1.70 (£1.40) but if you buy a carnet (a book of 10 tickets) the cost drops to €1.25 (£1.00). A Carte Mobilis is a day ticket again like a travelcard giving unlimited travel within certain zones. Zone 1-2 is €6.30 (£5.20) and zone 1-5 is €14.00 (£11.60). The Paris Métro also has a pre-pay system, the Navigo, which covers weekly and monthly travel. It requires a €5.00 deposit and a zone 1-2 fare is €62.00 (£51.50) for a month while zone 1-5 is €109.90 (£91.20). A former Paris resident tells us that people live everywhere and commute in all directions but travelling from La Motte-Picquet Grenelle to La Défense is roughly equal to Wood Green to the City in London. The New York subway equivalent of Oyster is MetroCard which travellers appear to be strongly encouraged to use. In fact, a single ticket is only available from a vending machine and costs $2.50 (£1.55). An adult single using the MetroCard is $2.25 (£1.42). There are no fare zones as with many other systems so the amount you top your MetroCard up by gives you a fixed number of rides on the subway. Using express buses costs more, as does the dedicated train service to JFK airport though the latter is only $5.00 as opposed to the woundingly large £18.00 charged by the Heathrow Express. 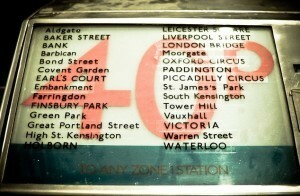 A 30 day unlimited ride card costs $104.00 (£65.00). They also have a version of auto top-up; the hideously concatenated EasyPayXpress MetroCard, which requires $30.00 to open the account but you get a 7% bonus every time you top up over $10.00, which is nice. Oh, and there are no child fares on the subway if your offspring are shorter than 44 inches. Any taller and they pay the adult fare. The Berlin U-Bahn (from 'Untergrundbahn', which means 'underground railway', fact fans) has three fare zones, known as A, B, and C, with zone A being the centre of the city. A single fare is valid across buses, trams and rail across the relevant zone and costs €3.00 (£2.50) for zones A-C. Interestingly, unlike London, dogs don't travel for free unless you have a day ticket and the fares even specify differences between large and small dogs. A day ticket in zones A-B is €6.30 (£5.20) and one for zones A-C is €6.80 (£5.65). The monthly equivalent is a VBB Eco Ticket which can be valid for either a calendar month or for a month from the date of purchase. One of these for zone A-B is €74.00 (£61.00) and for zone A-C it's €91.00 (£75.50). On the prepay front, Berlin is apparently being introduced to the Metrocard but we struggled to find any reliable information on this. If any Londonist readers can shed some light on it, do let us know in the comments. There's a kind of short-term version of one called the WelcomeCard but this is aimed at tourists rather than commuters. Consisting of three zones and just two lines it's the baby of our list but as one of only four underground networks in the UK and one of two outside London we thought we'd include the Tyne & Wear Metro for comparison's sake. It has a dizzying array of ticketing options but a single fare in one zone is £1.60 while travelling across zones A-C is £3.10. A DaySaver ticket, which allows unlimited travel on the Metro, rail and ferry is £2.70 for single zone and £5.00 for all three. As with the London underground, travelling after 9am is cheaper but we've gone for a commuting angle across all our comparisons. A Network One Travel Ticket, which gives access to local buses too, costs £58.80 for a month (single zone) and £80.90 for all zones. There's also a special ticket for the Toon Army to travel to matches which costs £10 but it's limited to Newcastle United season ticket holders only. The Tyne & Wear Metro doesn't have a pre-pay card option. So, here's a handy table showing the above transport networks all in GBP. We've shown Oyster single fares for London because the walk-up cash fares are so insanely overpriced that it would ruin any decent comparison. *Disclaimer: if anyone has better information on fares on these underground networks, please feel free to tell us in the comments. Likewise, we'd be interested to hear about your experiences on them.